Are you counting down the shopping days? We are. If you’re still puzzled by a few people on your list, we’re here to narrow it down with everything from the sweet little something to a serious splurge. “We curate our stores and our website to have something for everyone,” says Brenda Champney, East Coast Regional Manager. “So if you’re going to someone’s house for cocktails and need a hostess gift, we’ve got that and more.” Here’s a sampling of all that glitters and shines for you and yours. For the woman who likes to show off a little sparkle. Our collaboration with LA-based designer Logan Hollowell features sterling silver and 14K gold pieces with unique gemstones like moonstone, diamonds, and rubies. For the hostess, the mother-in-law or co-worker, our Talia fragrance is perfect. Handcrafted in Ojai, it’s a romantic mix of benzoin, musk, and vanilla that mingles with hints of orange and jasmine. The candle is an inviting warm scent for the holidays while the soap makes a scent-sational accent to any guest bathroom. A touch of our wanderlust inspiration that’s made to be packed and carried. Our Johnny Was Khali make-up bags are a beautiful kaleidoscope of prints from our silk scarves and have been topped off with a pom-pom tassel. The perfect place to stash small incidentals. Perfect for your best friend, daughter or a small token of holiday cheer to the women in your monthly book club. Bluma Project is crafted by artisans from all corners of the world and features gold plate, cotton tassels and bold color combinations that are the perfect accent to our printed tunics, dresses, and tops. The sweetest stocking stuffer. Scrunchies have had a resurgence this year and popped up everywhere from the runway to your yoga class. Ours are crafted from strips of fabric from our scarves, kimonos, and tunics and add a beautiful pop of cheer to your look. For the woman who wants the best. Our reversible Short Wonder Kimono is crafted from assorted panels of our signature silk prints and trimmed along the neckline and sleeves with a bright, artisan-inspired embroidery. This heirloom-quality cover-up will look just as gorgeous with a morning cup of coffee as at a black tie affair. Trust us, this one will be seriously appreciated. 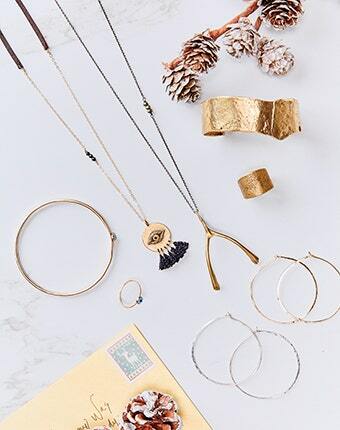 For more ideas and gift ideas for this season, jingle all the way over to our Holiday Edit.